Posted April 27, 2013. This is an article worth reading even if you already know you have Lyme disease. At the very end of the article it talks about the use of this technology to determine whether or not patients have been inadequately treated. It is my contention that many Lyme disease patients are under treated and for that reason have recurring Lyme symptoms. Something interesting to explore and share with your LLMD (Lyme Literate Medical Doctor). Early diagnosis is critical in treating Lyme disease. Existing tests, however, can only assess the presence of antibodies against bacterial proteins that take weeks to form after the initial infection and persist after the infection is gone. Now, a nanotechnology-inspired technique may lead to diagnostics that can detect the organism itself and could lead to earlier detection of the disease. This new technique resulted from a collaboration between Professor A. T. Charlie Johnson of the Department of Physics and Astronomy in the School of Arts & Sciences and Dustin Brisson, an assistant professor in theDepartment of Biology. Johnson’s group has experience attaching biological structures to carbon nanotubes, while Brisson provided the team with expertise on the bacterium. Carbon nanotubes, rolled-up lattices of carbon atoms, are highly conductive and sensitive to electrical charge, making them promising components of nanoscale electronic devices. 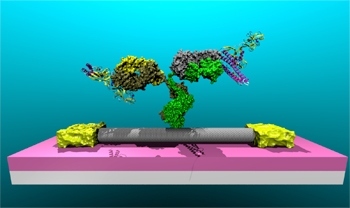 When a biological structure attached to the exterior of a nanotube binds to a molecule in the environment, that molecule’s charge can affect the electrical conduction of the nanotube. Such a device can, therefore, provide an electronic read-out of the presence, or even concentration, of a particular molecule. In their recent experiment, Johnson’s team attached antibodies that develop in most animals infected with Lyme disease to nanotube transistors. These antibodies naturally bind to a protein in the Lyme bacterium as part of the body’s immune response. After confirming that antibodies had bound to the exteriors of their nanotube transistors, the researchers tested them electrically to get a baseline reading. They then put the nanotubes in solutions that contained different concentrations of the target Lyme bacteria protein. A computer rendering of a nanotube transistor with an antibody attached. The smallest concentration the nanotube devices could detect was four nanograms of protein per milliliter of solution. “This sensitivity is more than sufficient to detect the Lyme disease bacterium in the blood of recently infected patients, and may be sufficient to detect the bacterium in fluids of patients that have received inadequate treatment,” Brisson says. This entry was posted in Lyme Symptoms and tagged Lyme Testing, Research. Bookmark the permalink.